Although there is at present no known cure for COPD, there are many things that patients can do that can make them feel a whole lot better. 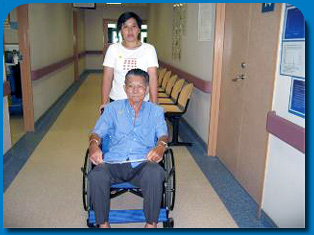 This section describes effective ways to treat the condition and is directed at helping patients overcome the disease. The medications that are prescribed for you can help to relieve and prevent symptoms, reduce the frequency and severity of attacks, and improve your exercise tolerance. They can be divided into bronchodilators (which open up the airways in your lungs), steroids (which reduce the swelling of the airways) and other medication that help to control symptoms or treat infections. Some of these medication may come in the form of inhalers, e.g. the bronchodilators and steroids, while others come in tablets or syrup form. These inhalers can be divided into beta2-agaonists and anti-cholinergics. They help to relax and prevent tightening of the muscles around the airways to allow better flow of air into the lungs, making breathing easier. Side effect of beta2-agonists include nervousness, restlessness, trembling of hands and pounding heart. Side effects of anti-cholinergics include dry mouth/throat, cough, nausea, headache and nervous. A new anti-cholinergic medication (Tiotropium) is presently available. Tiotropium is a novel compound that works through prolonged M3-receptor blockade and provides sustained relief to COPD patients with just once a day dosing. Clinical studies have shown that Tiotropium provides sustained improvement in breathlessness, the most frequent and disabling symptom of COPD, and is also very well-tolerated amongst patients www.spiriva.com. They decrease irritation and swelling of the airways, reduce production of mucus and prevent narrowing of airway muscles in the lungs. They do not provide fast relief, and therefore are not useful in a sudden attack of breathlessness and must be used regularly to prevent an attack. These side effects can be avoided by rinsing the mouth thoroughly with water after inhalation. Another product containing steroid in combination with beta2-agonist that is available and effective for treatment of oterol/budesonide www.symbicort.com. Your doctor may decide to give you a vaccination against pneumonia and/or influenza because people with COPD may suffer from serious consequences if they get these infections. - Pneumococcal infections can lead to pneumonia, brain infection, etc. - Uusually given once to each person (unless your physician decides that you need another dose. - The vaccine is usually given as an injection at the thigh or buttock region. - Influenza is a viral infection of the throat, airways and lungs, and it causes fever, chills, cough, headache, muscle aches, etc. Using oxygen continuously (for at least 15 hours a day) can improve longevity and quality of life in hypoxemic patients (patients with low or inadequate levels of oxygen in the body). However, you must always check with your doctor to assess if you will benefit from using oxygen on a long-term basis at home. This machine makes oxygen by taking in room air and sifting out the oxygen. It must be plugged into a grounded electrical outlet. Because the oxygen concentrator "makes" the oxygen, it does not need to be replaced or refilled regularly. A backup oxygen cylinder is sometimes provided in case of a power failure. This is a tank of compressed oxygen. Large tanks are used inside the home, and small tanks are used for outings or travel. How long the cylinders will last depends on the amount of oxygen the person uses. This system stores oxygen in liquid form. The liquid is kept in large stationary containers called reservoirs. Portable units are filled from the reservoir for travel or use outside the home. The liquid turns into gas before it leaves the container and it remains a gas when it is breathed in. How long these three oxygen systems last depends on the amount of oxygen a person uses. Will I need oxygen therapy for the rest of my life? Your doctor will decide whether you need long-term oxygen therapy. You may not need long-term oxygen therapy after completing the treatment your doctor has prescribed. Shortness of breath does not always mean you have a low oxygen level. Shortness of breath may be caused by the type of activity you do, the lifestyle that you have, whether you have any other lung disease or allergies, or whether you are stressed. Your doctor may be able to recommend ways to help you ease your symptoms without the inconvenience and expense of any oxygen system. 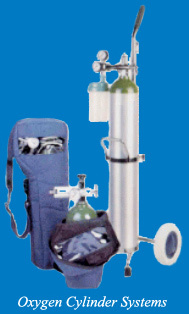 Are there any precautions I should take when using an oxygen system? Oxygen users must take precautions because these systems are inflammable. Keep oxygen systems away from sources of heat or open flame. Do not smoke or let anyone else smoke in the area where you use oxygen. Smoking is a health risk and removes the benefits of oxygen therapy. It is also a fire hazard. Ask visitors not to smoke. Ask your oxygen vendor for a warning sign that you can put up wherever you use oxygen. Store oxygen in a well-ventilated area. Do not store cylinders or liquid units in a closet. Do not use Vaseline or other petroleum products on your face. If the oxygen or tubing causes irritation and drying of the nose, call your doctor or oxygen supplier for suggested remedies. Oxygen systems deliver oxygen continuously while you inhale and exhale. However, when you exhale most of the oxygen goes into the room. Conserving devices helps to reduce the amount wasted. Your oxygen supply lasts longer and you can go for longer outings. Conserving devices also cuts down on the number of deliveries from your vendor. Ask your doctor about the different types available. 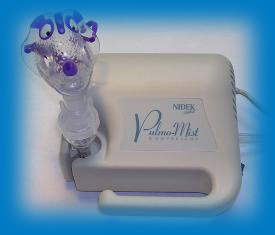 Some medication can also be inhaled using a device called a nebulizer (see photo). More information on related equipment and devices are available at: www.innovmedics.com. If you haven't quit smoking, do it now. It is the best move you can make to improve your life with COPD. It can also be the most difficult thing you've ever tried to do. Nicotine is very addictive, and people often make 2, 3 or more tries before finally quitting for good. Studies have shown that each time you quit, you'll become stronger and learn more about what it takes for you to quit permanently.
. Use the nicotine patch, nicotine gum or nicotine inhaler[ Nicorette® Permit Number :MAHP147377 ]. It can help lessen your urge to smoke. Check with your doctor first to make sure it will not interfere with other medicines and to select the correct dosage. Be especially careful if you have heart or blood vessel problems. Ask your doctor about prescription medicines such as bupropion that can also help.
. Get support and encouragement. Studies of former smokers show that the more support you have, the better your chance of success. Counseling and/or a quit smoking programmer can be very helpful. Get family members and friends, especially ex-smokers, to help you resist the urge to smoke.
. Learn how to handle stress and urge to smoke. Make a plan to handle those pressures and situations that make you want to smoke, such as being around other smokers, drinking alcohol and feeling stressed or depressed. Remember, your best chance of success is with the help of others. We strongly recommend that you visit Health Promotion Board website for further help in kicking the habit. There are many benefits of exercise. Exercise helps to tone up muscles, reduce body fat, strengthen bones, increase good cholesterol in the blood, reduce risk of heart disease, high blood pressure and diabetes. 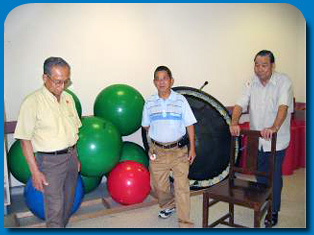 It also helps to relieve stress, improve stamina, and people usually sleep better and feel good after exercising. However, many people suffering from COPD avoid exercising because of the fear of getting breathless. Avoiding exercising will make them less fit. Being less fit will make them short of breath even with light activities and mild exertion. 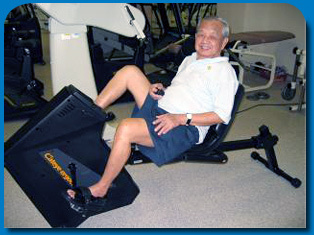 Regular exercise may help to reduce the sensation of breathlessness and improve quality of life.
. Always warm up before strenuous exercise to prevent injury.
. Progress gradually. Increase the duration and intensity of exercises as your fitness level improves.
. Set your own pace and exercise in moderation.
. Stop if you experience a problem, such as chest pain, nausea, dizziness, or if you feel very breathless. Do not exercise when you have a fever.
. Use your inhaler before exercising or as prescribed by your doctor.
. Use oxygen to supplement if prescribed by your doctor.
. Apply breathing control techniques during the exercises.
. Gradually slow down before you stop exercising. Take time to warm down by doing muscle stretching.
. Stretching exercises improve flexibility and suppleness. They prepare your muscles for more vigorous exercises.
. Cardiovascular or aerobic exercises are continuous exercise at moderate to high intensity. Your heart rate increases, you breathe deeper and perspire during the exercises. They help to improve your endurance and your general fitness. You can choose any form of exercise that you enjoy such as walking, cycling or dancing.